Excitement, hope-filled anticipation, a sense of peace and some trepidation – these are just a few of the many emotions being felt by the incoming Bishop of Darwin on the eve of his ordination. Speaking about his priorities, goals and concerns for his new flock, Fr Charles Gauci said he intended to focus his time on listening to the people, learning from them and working out how best to serve them.Fr Gauci, who was the administrator of St Francis Xavier’s Cathedral in Adelaide, was appointed to the role in June by Pope Francis, who at the same time accepted the retirement of Bishop Eugene Hurley. Bishop Hurley has served in Darwin for the past 11 years and as a bishop for almost 20 years. “Bishop Eugene gave me some good advice: Don’t try to imagine it all now, wait until the grace of ordination to imagine it,” Fr Gauci said. However, one significant task would be to make the Gospel more accessible. “We need to find ways of translating the Gospel in a way that is intelligible and understandable to the people of our time,” Fr Gauci said. “I want to ensure that we as priests and bishops are accessible to the people. We need to be available and the people need to know that we are here to serve them. We need to go out of our comfort zone so that we are truly available. Offering a ministry of salvation from addiction, incarceration and self-esteem issues, and being fully human in Christ were all among Fr Gauci’s goals for the diocese – a vision he believes he shares with Jesus, the call of the Vatican Council and the message of Pope Francis. Reflecting on the difficult issues facing the Church in Australia, Fr Gauci said he was encouraged by the trust that he had already seen in the diocese. But he can also see the many real challenges in the wider community, including the detention of young Indigenous people, justice equity and substance abuse. “I think for many of our priests, we’ve got a challenge to be relevant with the way we speak and proclaim the Gospel. “I’ve been here for 10 days and I had a wonderful experience where we confirmed about 115 Indigenous young people and young adults. When I visited the Indigenous people a few days ago, it was an eye-opener for me – their hopefulness, their warmth and their need to be connected spiritually. Fr Gauci said the huge diocese, which covers almost all of the Northern Territory, was complex and he saw challenges but also opportunities. “I see lots of good things here. I see this is a vast area where you’ve got a very contemporary 21st-century city in Darwin and then you’ve got rural areas where people are leading traditional lives as they have for thousands of years,” he said. “You need to be right there with the smell of the sheep. We, the Church, need a good dose of humility; we need to be on a learning curve. 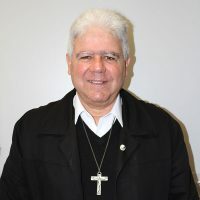 Fr Gauci was born in Malta and arrived in Australia as a 13-year-old. He was ordained for Adelaide in 1977 and has served in parishes across the Archdiocese. He has also held a number of archdiocesan leadership roles. Fr Gauci’s episcopal ordination will take place at Darwin’s St Mary’s Cathedral on Wednesday evening, September 26. The ordination will be livestreamed via the Diocese of Darwin website from 6.30pm local time. This entry was posted in Uncategorized on September 25, 2018 by ACBC Communications.